Promote quality control and assurance by offering a superior selection of products for dairy and food testing and by making the acquisition of laboratory supplies and equipment as affordable and easy as possible. 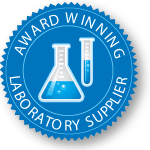 Weber Scientific distributes laboratory supplies and equipment throughout North America and is focused on the specialized testing needs of the dairy and food industries. NJDL Supplies, Inc. (doing business as Weber Scientific since 1985) was formed in 1959 as part of New Jersey Dairy Laboratories, a commercial testing facility. New Jersey Dairy Laboratories, located in New Brunswick, was founded in 1936 and is still active today as New Jersey Laboratories. The company was started for several reasons. Many of New Jersey Dairy Laboratories’ customers — dairy processors in the metropolitan tri-state area — were beginning to put laboratories in-house for the first time and requested that their commercial lab supply them with what they would need. Also, New Jersey Dairy Laboratories had several exclusive products, primarily the Gerber butterfat test and the Levowitz-Weber bacteriological stain. Weber Scientific has evolved to become an industry leader, maintaining a focus primarily to the dairy and food processing industries. Our primary headquarters and warehouse are located in Hamilton, NJ. We have further distribution points around the country. Weber Scientific is a laboratory supplier that you will actually enjoy doing business with. More than ever we hear that the mega-sized suppliers aren’t particularly focused on the specialized needs of food and dairy labs, and that their level of service is often indifferent. Great Product Selection. We’re specialists in quality control supplies for food and dairy labs. You’ll find hundreds of laboratory essentials plus many exclusive and hard-to-find items. Legendary for great prices. We offer some of the best prices in the industry without any of the dickering or hassles and without committing to any complicated or long-term contracts. Free freight upgrades. Receive expedited service nationwide at our expense – not yours. Frequent Buyers Program. Our way to express appreciation for your continued support. 100% Satisfaction Guarantee. Count on it! We’ve worked hard for nearly 60 years to earn your trust.